In addition to the core courses, students at the CDTM can choose electives. This semester our Center Assistants (CAs) came up with something extraordinary: “Center Farming”. During the course of the semester, we built a “food computer”. A tabletop-sized, controlled environment agriculture technology platform that uses robotic systems to control and monitor climate, energy, and plant growth inside of a specialized growing chamber. It is based on hydroponics, which means the plants grow in water instead of soil. I don’t have green fingers and whenever I take a tool in my hands, usually someone comes and takes it away from me. But I was up for a challenge and wanted to learn from more skilled craftsmen at the CDTM, so I signed up for the elective. This is what the Center is all about: bringing together students from different backgrounds and learning from each other! During the kickoff, we learnt that the food computer is an OpenSource project from the MIT Media Lab. The so-called Open Agriculture Initiative (OpenAg) has the goal to create healthier, more engaging, and more inventive future food systems. They published a manual and a parts list, so anyone in the world could theoretically rebuild it. The idea is that the plants grow in a controlled and almost autonomous chamber, which means you could also grow strawberries in the desert. We had an interesting guest lecture from UN World Food Program which put the topic into a global context. Even though, most people in the western world are not really affected, there are still 815 Million people who suffer from hunger. New technologies and approaches like hydroponics can be a solution. They told us about fascinating pilot projects which allow remote farmers to grow fodder for their farm animals under extreme conditions (windy mountains, dry deserts etc.). Also, we learnt that the Center Assistants have been ordering hundreds of parts which are required to build the computer. The MIT provides a comprehensive list, but unfortunately sometimes you cannot get the exact same product in Europe and need to go for alternatives. Additionally, we formed four teams for the upcoming hackathon weekends. “Brain” (software), “Frame & Lighting”, “Power & Electronics” and “Water Manifold & Chiller”. On day 1, you could tell that this was going to be an experiment. Gathering the required parts from the boxes for each of the teams took quite some time. 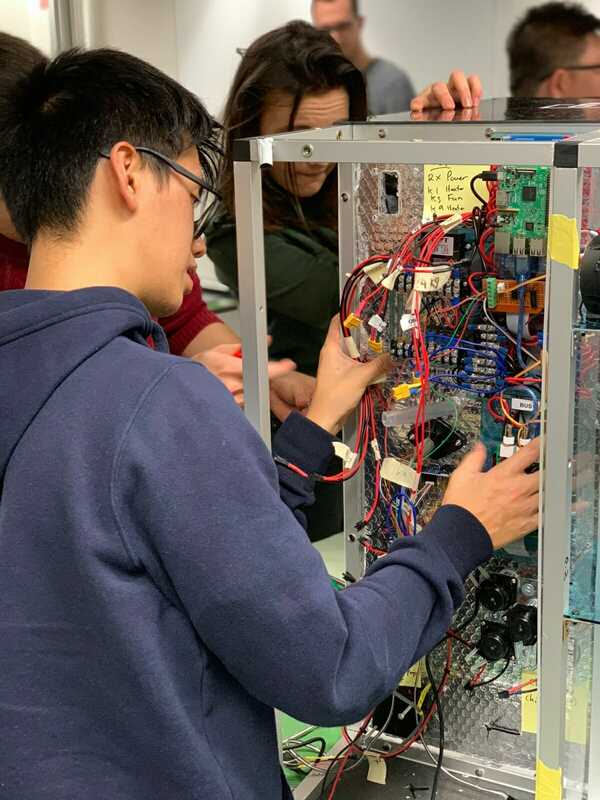 Once everything was in place and one team came back from the MakerSpace (high tech workshop in Garching) with the laser cut and drilled panels and frames, every team started assembling. We figured out quite soon, that some parts (mostly screws) were missing (or we lost them…). So, my team went to the DIY store. On a Saturday afternoon. Trying to buy screws with an American threading. A few hours of hunting down grumpy Bavarian DIY shopping assistants through the crowds, we found out that no DIY store in Munich has the needed screws in stock. “Screw it” we thought to ourselves and bought the European alternative – including new nuts. We were missing the customized signal board that we had to order from MIT. 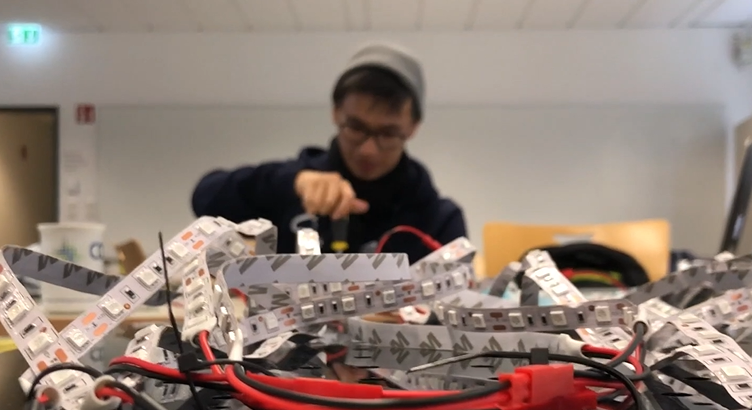 This was the moment where the interdisciplinary approach at CDTM showed once again its strength: One fellow student did some “Electrical Engineering magic” and quickly reverse engineered the whole thing. It was fascinating how quickly he prototyped a first version of it – and the most important point, it did work in the end and we could continue our mission. Day 2 felt much more productive as we finally had everything we needed. Nonetheless, I think building a food computer together with 13 people helps you understand why big corporates with many departments are slower than startups. There are a lot of dependencies such as: no LED tests without power supply, no power supply without wire schematic, no wire schematic without browsing through forums for hours etc. 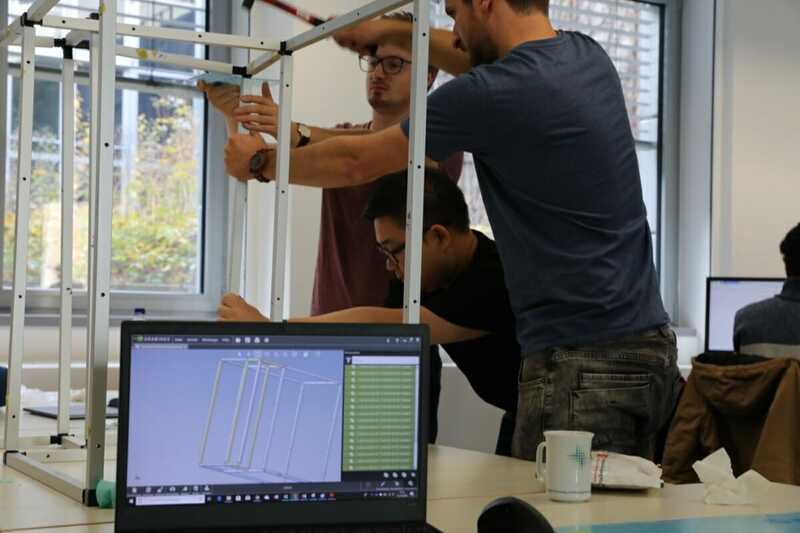 By the end of the hackathon weekend, we had frame and all the electronic parts assembled but not integrated anything yet. Integration test plan: Come up with a plan on how to test all the modules. Center farming plan: How, what and when do we plant? Business plan: Build a startup business case around the food computer. Center integration: How can we integrate the sensor data in the existing IT infrastructure at CDTM? A few unplanned extra hours later, we were ready for testing. After initial difficulties, we managed to get each of the components to work properly. All of them interact with the “brain” which is an Arduino controller and a Raspberry Pi computer. In the first weeks of the course, everyone talked about super exotic plants like pineapples, avocados and even coconuts. After a talk from the founder of Plantura (CDTM Alumnus Felix Lill), we were brought back to reality: “Start with kale. If you are extremely good at it, you might try carrots. We hire anyone who successfully grows carrots in the food computer”. So, we lowered our expectations and chose regular lettuce. 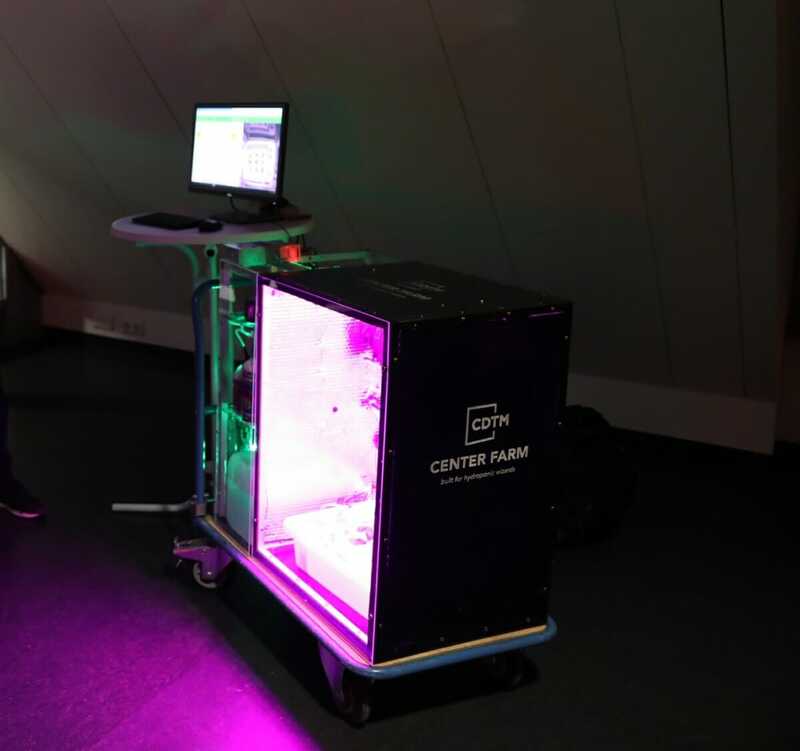 Even though we did not harvest yet, the food computer is now a new element of our smart center and we are looking forward to harvesting the first lettuce soon. I can already say that the elective was a full success. I was able to participate in the assembly process despite zero prior knowledge or skills. This is what I love about CDTM, it is probably the only place where business students start soldering while engineers come up with business plans to commercialize the output of our food computer.